The ancient Maya left a legacy of knowledge to guide us on our path, help us discover our purpose and how to fulfill it in this lifetime. They left incredible Living Seeds of Wisdom in their temples, ceremonies, pottery, sacred books and also with today’s practicing shamans. On this journey you will experience the energy of the temples and ceremonies, open up to the teachings depicted in their pottery and sample the deep wisdom of their ancient books as well as spend time with a local shaman who is keeping the ancient traditions of the Maya alive. to help integrate the teachings into the body. many will be arriving late there are no meals or events planned for arrival day. keeping balance and harmony between the spirit elementals of the area. “The sacred meaning of Chakmultun is “The Temple with the Color of the Sun”. 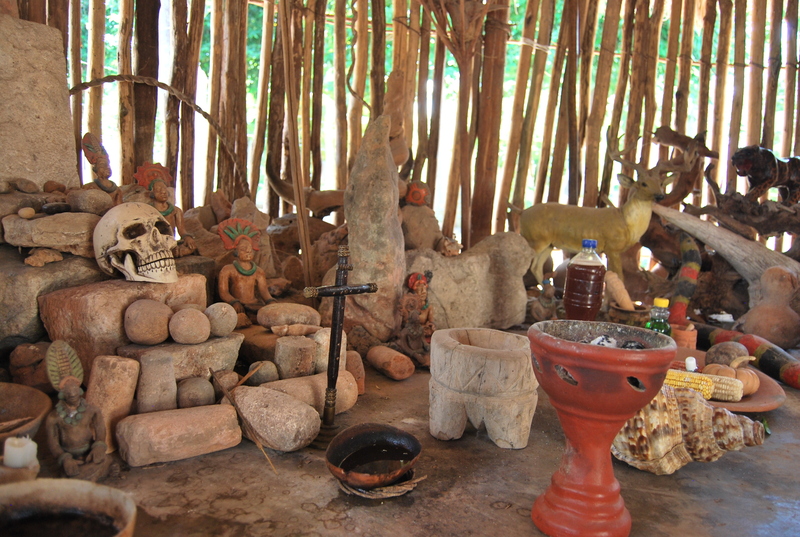 Local Shaman: This morning we visit a local Shaman who works with medicinal plants. We will explore his herb garden and have a practical demonstration and a discussion on healing with plants. There will be an opportunity to ask questions. Maya Pottery: This afternoon we visit a very gifted Maya artist who brings the wisdom of the ancient Maya to life in her pottery. Miguel Angel will interpret some of her pieces, sharing the sacred meaning of the images. You will meet the artist, visit her studio and have the opportunity to ask her questions about how she works. This morning we transfer to the beautiful Hotel Tucan Siho Playa on the beach in Campeche. There will be time to settle in, swim and eat lunch before we begin our afternoon session. The Chilam Balam: Living Seeds of Wisdom found in the Maya ancient books. Miguel Angel will share some of the profound teachings preserved in the Chilam Balam. He will discuss the sacred meanings of these stories and how to apply them in our life process today. Yoga with Kat: Join Kat for a fun yoga session on the beach. Dinner together with discussions and sharing of experiences. unlimited power to be found in the 5 elements. Practices and Initiations: Join Miguel Angel and Kat for practices with the 5 elements. There will also be Halach Uinik initiations for those qualifying. Merida. There is a discussion group planned for this evening. For our final day together we will enjoy a swim in a cenote, a natural well considered sacred to the Maya. Our closing ceremony will be in the Maya site of Mayapan. Touching on each of the 5 elements we will put into practice what we have learned and participate in a powerful focused meditation for manifesting what we truly want. There will be a farewell lunch and then we return to Merida where you have a free evening to do any shopping or prepare for your flight home tomorrow. no meals or events planned for departure day. In order to have meaningful sharing circles and group discussions we are limiting the number of participants. It is an intensive training, a full week of deep experiences as you collect these Seeds of Wisdom and learn how to manifest here on Earth. There will also be Halach Uinik initiations for those qualifying. All prices are per person in USD.